The Great British Meal Out consists of that iconic British culinary triumvirate: Prawn Cocktail, Steak Garni and Chips, Black Forest Gâteau. The Prawn Cocktail Years describes it as “the favourite British meal out for as long as one can remember”. For a long time, you were pretty much guaranteed to find all those three things on any popular restaurant menu, but in some ways, that very popularity has been their downfall. Over time, they started to fall out of favour, being seen as the “safe”, and therefore “boring” option. Black Forest Gâteau is an uncommon sight on menus these days, and when found, it’s often an unappealing mass produced pile of overly-sweet chocolate sponge and cream. Even the once ubiquitous prawn cocktail is fading away. A good prawn cocktail is exquisite, but too often it turned out to be a watery pile of tiny tasteless, defrosted prawns smothered in a bland pink sauce. Perhaps it’s a good thing that we don’t see it quite so often any more. 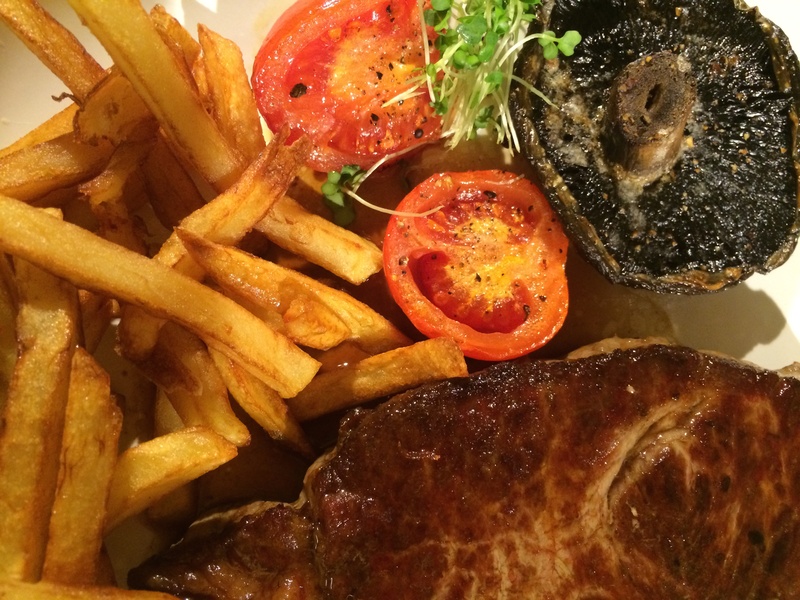 Steak and chips is the only one of the three that remains as popular as ever. It’s a mainstay on every pub and restaurant menu, and with good reason – it’s one of those few dishes that can be done far better in a commercial kitchen than you can ever manage at home. So, to kick off my trip through The Prawn Cocktail Years, The Great British Meal Out felt like an appropriate place to start. It’s a full three-course meal, not something I tackle very often these days, but it surely should be pretty straightforward. I’ve made the prawn cocktail quite a few times; I know that’s easy. Steak and chips is also a pretty regular meal here, so I’m perfectly comfortable tackling that. It’s the gâteau that’s the problem. I don’t really have much of a sweet tooth – I’m definitely a savoury kind of guy – so I don’t make things like cakes very often. 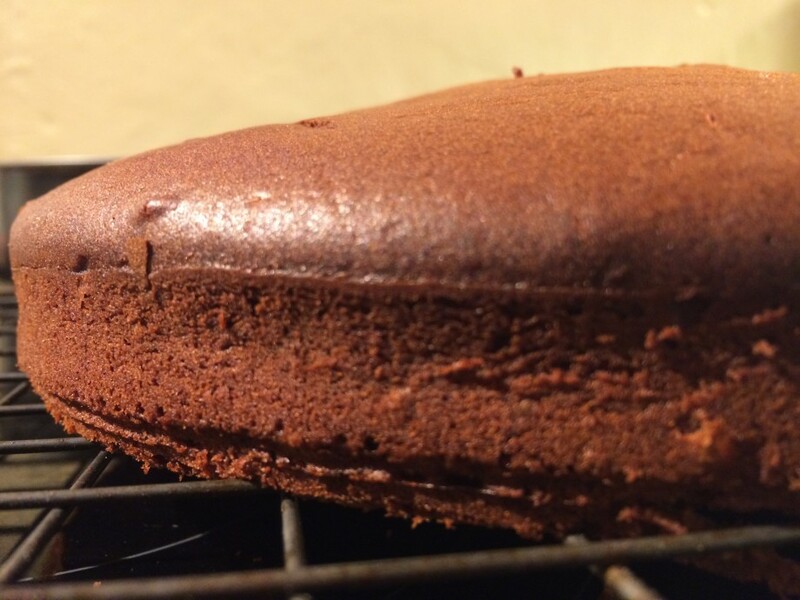 The prospect of making not just a cake, but a ‘gâteau’? Well that’s rather daunting. Saturday afternoon, time to bake the cake. 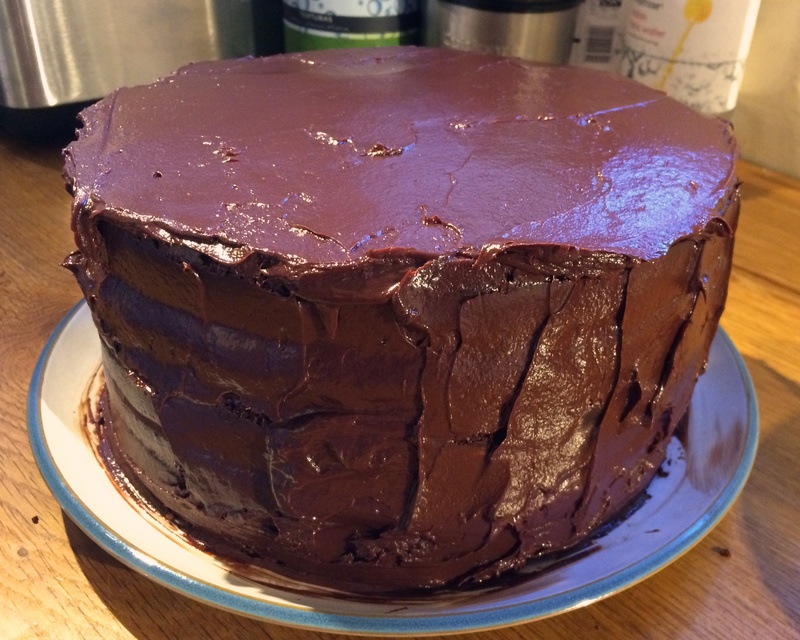 The first hiccup: the recipe called for a 20cm cake tin. I had a 22.5cm tin. OK, fine, I can just scale up the recipe a bit – it’s just a bit of maths. Volume of a round cake is proportional to the square of the diameter. So, (22.5 * 22.5)/(20 * 20) = 1.265625. That’s near as dammit 1¼, so I just increase all the ingredients by a quarter. Easy. First melt butter and sugar in a pan. Sieve flour and cocoa into a bowl. 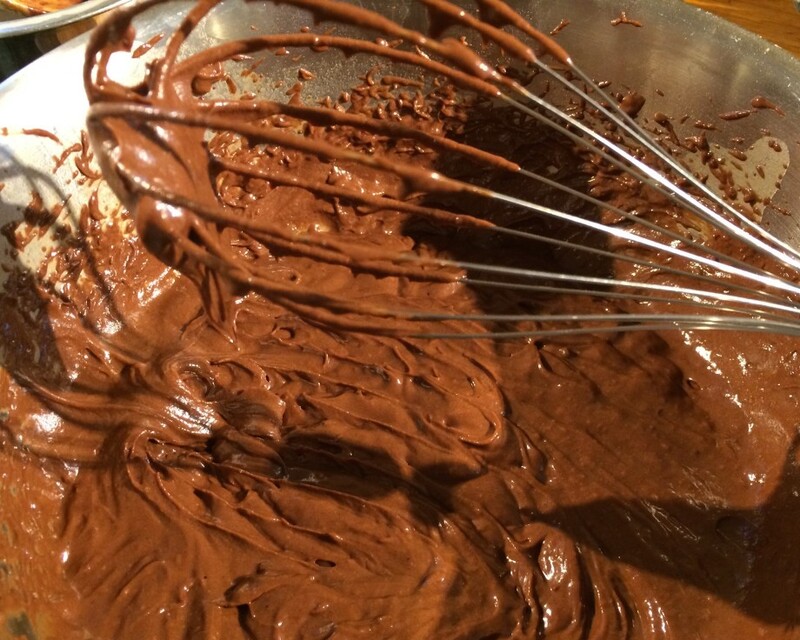 Mix all together, with eggs and milk, and whisk until smooth. I poured the mix into the cake tin. It looked a paltry measure of cake mix in the bottom of the tin. Oh well, it would rise. Into the oven it went. 40 minutes later, out it came. It had risen, but still didn’t look very big. I left it to cool a little and then turned it out onto a cooling rack. It was tiny. I was supposed to slice this into three horizontal layers – I’d be struggling to manage two with this! This clearly wasn’t going to work. Dispirited, I sat down and considered my options. The texture of the cake that I could see looked OK, it didn’t seem that it simply hadn’t risen – there just didn’t appear to be enough of it. Right. I would just make another. This time, I would double all the ingredients. That would surely produce a big enough cake. I had enough of all the ingredients I needed, bar one. Soft dark brown sugar. So, I improvised. I used a combination of dark muscovado (which was anything but soft) and golden demerara. After melting with the butter, it still seemed a bit gritty, but I was sure that it would be fine once I started beating it with the milk and eggs. Sure enough, the slight grittiness seemed to disappear, so I poured it into the cake tin. This looked like a more promising amount. I was worried though, that this time I might have overdone it, so I placed the whole think on a baking tray just in case it spilled over the top during baking. After forty minutes in the oven, I took it out – the outer crust looked just like my first attempt, but the inside was clearly still very liquid – the whole thing quivered, jelly-like. I put the cake back in the oven for another 15 minutes. This was firmer, but testing with a skewer, still clearly not ready. Back in for 20 minutes. This time, the skewer came out clean. I tried again in another part of the cake: ah, not quite. But we’re close. I gave it another five minutes, and then took it out. The cake was done. 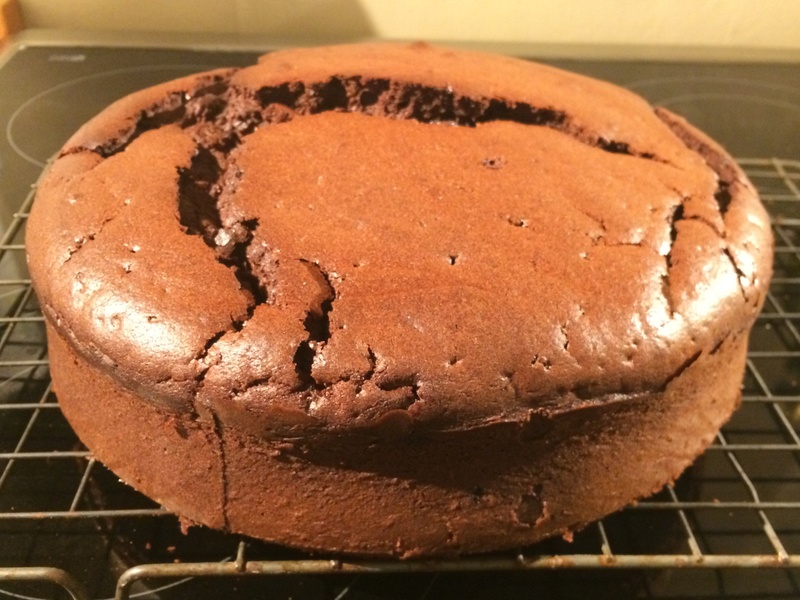 It had risen, but my fears were unfounded – It hadn’t spilled over the tin. This one did look like a more realistic size, so I let it cool a little and took it out of the tin. I felt much happier. With the cake-making trauma out of the way, that was enough for the day. The rest could wait for tomorrow. Sunday. To start the day (well, after the first cup of coffee), it was time to cut the cake. I needed three horizontal slices – to make three discs that could then be stacked on top of each other. The problem was that the domed top of the cake was cracked. If I cut it, it was likely to break up. Well, I had to at least try. Taking careful aim with the bread knife, I sliced into the cake. As expected, the top broke up. So, I was left with a cake that I could easily cut into two slices (which I then did), but I still needed a third slice. Luckily, I had a spare cake! The first-attempt cake from the previous day was thick enough to get one slice from, so I cut off the ragged top, and the remaining disc matched perfectly the two slices from the other cake. At last, I had the pieces of cake I needed. I doused them with syrup from the tinned cherries mixed with a generous dash of kirsch. I added a little whipped cream and some cherries, and we had a cake! The final step was to cover it in an “icing” made from cream and chocolate. Sue tried to convince me that it didn’t need it, but the recipe called for it, so I must do it. I must admit, I too was a little skeptical. I thought the sides of the cake would be difficult to cover, but it really did turn out pretty well in the end. But it was huge. I now had a monster of a cake. Twenty two and a half centimetres diameter and nearly six inches tall (I know, I know. Cake tin sizes are metric. Cake heights are definitely imperial), I’m really not sure I’ve ever seen a cake this big. That cake alone could probably feed thousands, but it was only one course of three. Time to move on. Next, I made mayonnaise – I needed this for the prawn cocktail. Mayonnaise is a regular of mine, so nothing too demanding here. The Prawn Cocktail Years recipe has it hand whisked, but I feel we’ve moved on a bit since the book was published. My little Cuisinart food processor made short work of those egg yolks and oil, and the mayonnaise was ready in a few minutes. The rest is easy. Prawns get peeled, lettuce, cucumber and spring onion chopped. Marie-rose sauce made. And lo, we have prawn cocktail. Big decision now. Chips. The recipe said “cut the potatoes lengthways into your preferred thickness”, so what should I do? Chips or fries? In the end, I opted for fries, mainly because that meant I could use my mandoline to make the chopping a little easier. Now, I deviated from the recipe slightly. The book demands I fry the chips in groundnut oil. I’m firmly of the belief that the best chips are those fried in beef dripping. There are some things you cannot compromise on, so beef dripping it was. The chips were cooked using the standard two-stage fry. First, they are fried in hot fat until just cooked and then set to one side. Just before serving, the chips are cooked a second time to give them their final crispness. Sadly, it’s not really the best time of year for chip-making. As the season progresses, more of the starches in the potato are converted into sugars. It is these sugars that provide the nice golden colour as the chips cook. If there is too much much sugar present, the chips brown too quickly. So, these chips turned out a little browner than I’d normally like. The ‘garni’ was simple. Two mushrooms and two tomatoes, in a hot oven for twenty minutes. The steak itself was similarly straightforward: a few minutes each side in a hot frying pan, then put to one side to rest whilst the chips undergo their final frying. The prawn cocktail was, as ever, delicious. The prawns were substantial and very tasty. The tang of the marie-rose sauce complemented them perfectly, as did the suggested accompaniment of Tanqueray and tonic. I served the prawn cocktail with a few extra tiger prawns, simply because they really needed eating up, and so it ended up being a rather substantial starter. We paused for a little while before the next course. The steak and chips? Well, it was just steak and chips really. I eat this meal often enough for it to not seem particularly special. The chips weren’t the best I’ve ever cooked, principally because of the potatoes. They were browner than they should be and had a slight sweetness to them. I’ve already said that I’m not really a cake person. 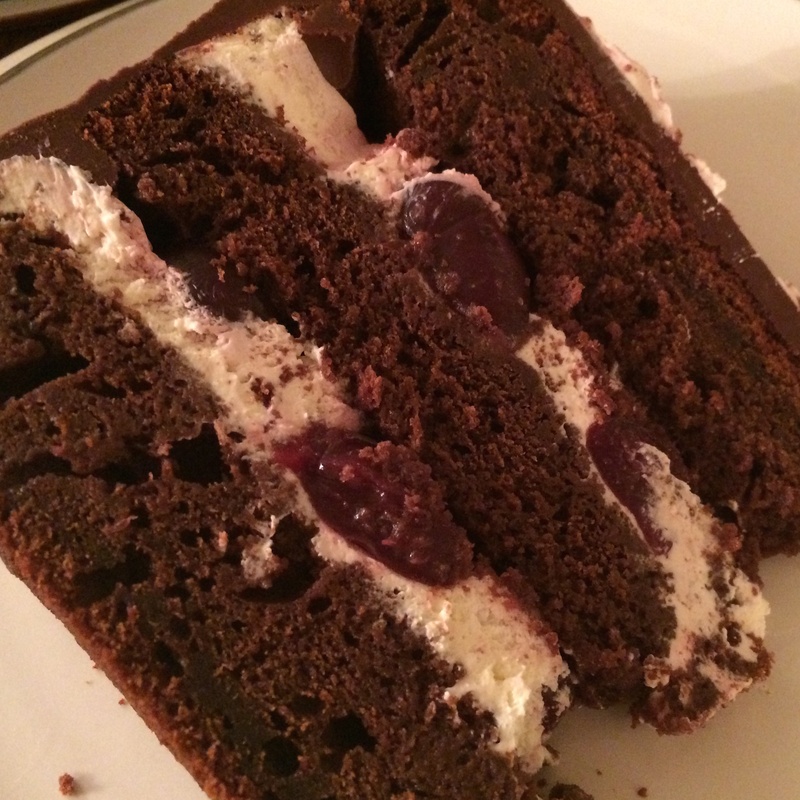 but I have to say the Black Forest Gâteau was really rather good. 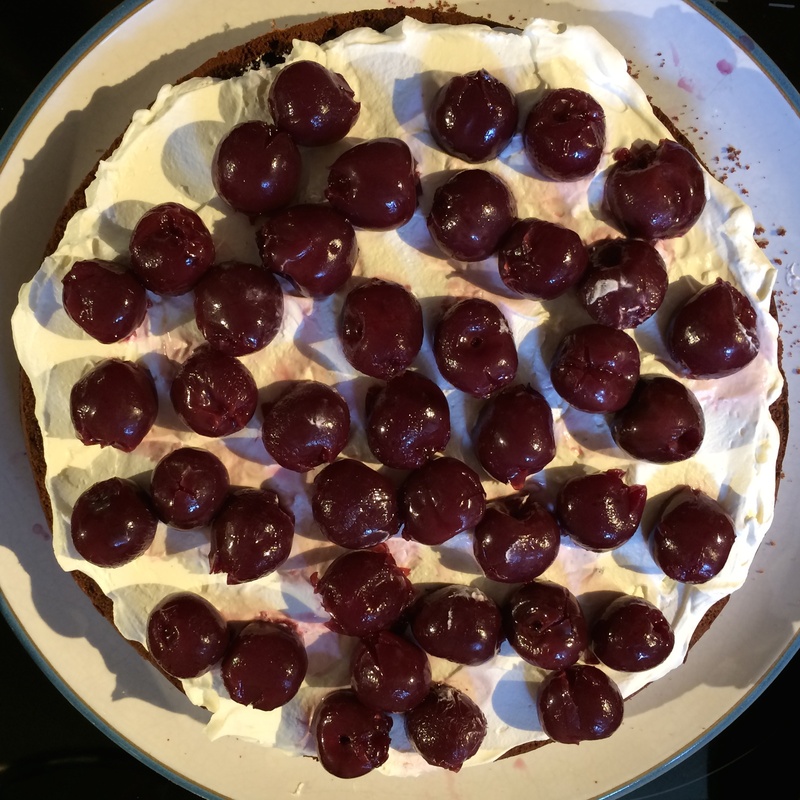 The rich chocolate cake (not too sweet – the downfall of many a pudding for me), the layers of cream and the cherries all balanced each other perfectly. When cut, it looked exactly like the picture on the back cover of my edition of The Prawn Cocktail Years. The only real problem with it was that after the first two courses, I just couldn’t manage a whole slice. I’m afraid I left some of mine. The gâteau really was enormous. Our two slices made barely a dent. I spent a little while this afternoon hacking it into smaller chunks to give away to friends. I hope they like it, there’s no way we can eat this beast on our own. I have been drooling over the picture of Black Forest Gâteau on the back of this book since Dave bought it. That’s something like 17 years. So I was thrilled when he told me about his new blog project. I admit that I was surprised to be getting the gâteau in the first week, but hey. 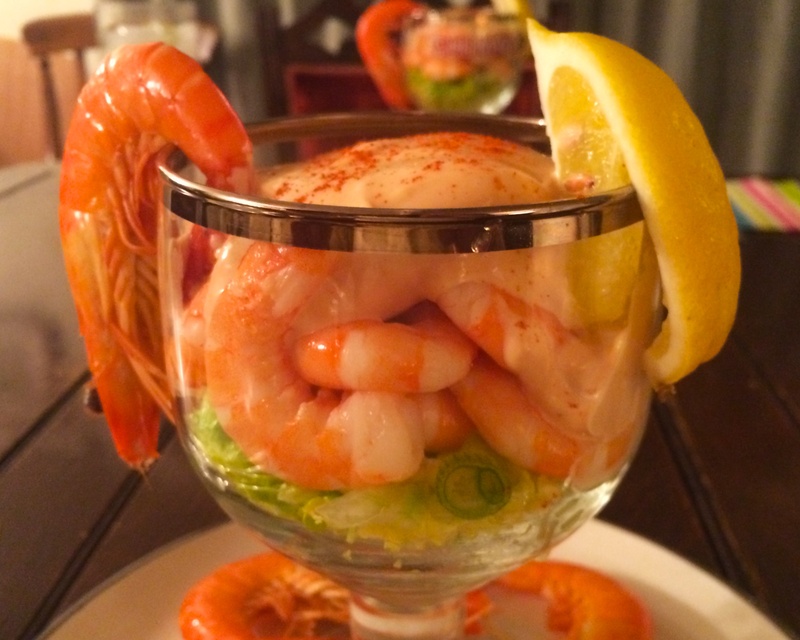 Prawn Cocktail – a long time favourite of mine. I regularly request this version on my birthday. It is everything the current idea of prawn cocktail is not. Fat, juicy prawns on a bed of crisp, cold, chopped lettuce. 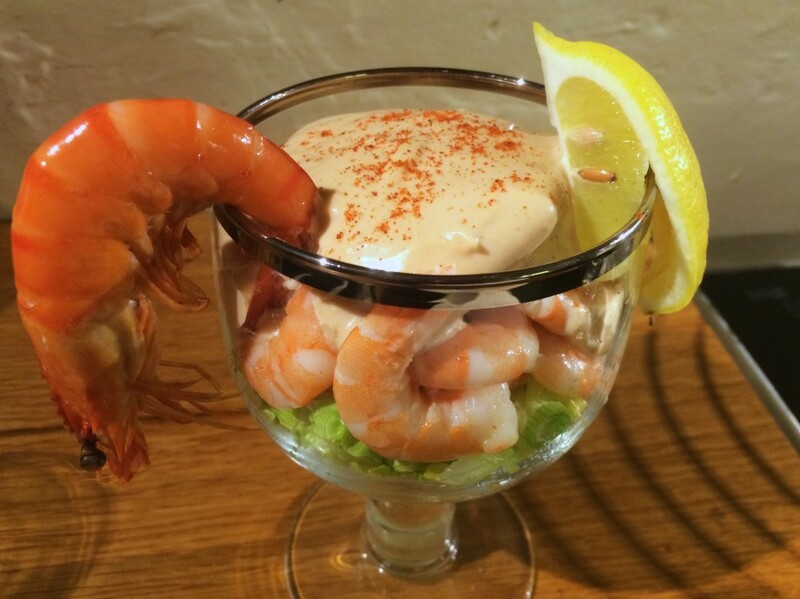 Smothered over with Marie Rose sauce made with homemade mayonnaise, brandy, lemon juice and tang. Perfect. On the side a special 2 or 3 tiger prawns or crevettes. This Sunday’s version was delicious as ever. My only criticism is that I like a mix of smaller and larger prawns and this time they were all large. There is considerable difference in texture and flavour between the different sizes of prawn and I missed the mix. On to the steak, chips and garni. My steak was perfectly done medium rare. With a tasty, salty seared edge. The mushroom cooked with butter was good. I have a thing about not liking mushrooms, so it’s a compliment from me if I say it was good and I ate it all. Roast tomatoes I love, we even had the little bunch of cress. Sadly this isn’t the time for good chips. The potatoes are going over – too starchy. So the fries were only so-so, not chef’s fault. First impression? Enormous! I have never seen such a huge cake. It was like a hat box. Covered (very well) with glossy chocolate ganache. It was all I hoped it would be. My only criticism is that the cherries needed more of a kirsch punch and the cake may be a fraction dry. Not much though, and it could simply be the power of all that rich dark chocolate creating the dryness on the tongue. I would give it 10/10 for looks and 8/10 for eating. Hmm. I’m not sure you’re allowed to go off piste, are you? I intend to stick as close to the recipes as is reasonably possible. There may be the occasional minor adjustment (beef dripping instead of groundnut oil), and possibly more significant excursions if something goes horribly wrong (my cake is too small!). Other than that, I intend to stay well en piste.